My name is Durrell Smith, and over the coming months, I will be contributing regularly to the Orvis Hunting Blog. It will be a pleasure to share a bit of my story, and to describe my insights, lessons, and adventures as I pursue the wonderful journey that is bird hunting. Currently, it’s hunting season 2018, and I am seriously looking forward to pursuing wild quail in southeastern Georgia. I find myself deeply connected to the tradition and history of hunting bobwhite quail in Georgia, as the practice is central to the legacy of many southern African-American upland bird hunters. This is a history that I’m intellectually curious about and inspired by daily; I am driven to learn more about the tradition of hunting as a whole as I continue to learn, grow, and contribute. Though I am a bit of a minority in terms of exposure in the hunting and gun-dog world, I’d be lying if I said that I have felt any less included in this community. The culture of bird hunting and dog training has embraced me, and I appreciate that. What makes this experience so dynamic is the fact that a dog always becomes the common denominator and learning is the end goal, so when I enter the training or hunting space, I never meet a stranger. I would be remiss If I did not share a bit about my introduction to the uplands and my development as an upland and waterfowl hunter, and as a dog trainer. Context and history aside, what remains most fascinating to me in my experience as a hunter is watching my young Labrador, “Polished Ruger”, flush birds and learn the landscape. Ruger and I have taken an indescribable journey together because I trained him myself, and nearly all of what we know about hunting we learned together. Ruger is a darn talented dog; what he lacks in a fancy pedigree, he makes up for in a background that is filled with love and a thoughtful breeding conducted by my good friend Melanie. Ruger is the dog that taught me patience; he too has been the patient subject of my efforts to train what I’d consider a fine shooting dog, though I call him my “country dawg”. As a writer, illustrator, amateur gun dog trainer, and podcast host, I am somehow creatively attracted to the rhythms and motions of a bird dog traversing the woods, pulling with both front paws, and back legs pushing like pistons through the pine woods. When I think of beauty, I think of the uplands, and I’d rather not think of uplands that do not contain my gun dog. We should want to learn to know our dogs, and through that, learn to know ourselves a bit better. At least that’s what I’ve done. In the coming months I will use the Orvis blog to engage a new readership in the hopes of creating gateways into the wingshooting and dog training communities. These blog entries will provide my thoughts, insights and discoveries, chronicling the process of becoming a bird hunter for those who, like me, may not have grown up with a background in hunting. My entries should pursue a format similar to the one I have used personally through my learning process, a format that evolved out of what I call The Gun Dog Notebook. The Gun Dog Notebook was simply my way of recording what I observed in the process of hunting, shooting, and training Ruger. Honestly, training Ruger really only took a high level of observation, dedication, and passion. The Gun Dog Notebook became a safe space for observation and analysis of my dog and myself, and it also presented a canvas of appreciation for the art of the uplands. Writing about my experience allows me to share it with others. I also hope to emphasize how critical it is that we share our stories. Our stories become our personal legends; they highlight the search for birds and the culture that surrounds that search, inherently serving as an opportunity to search for ourselves a bit too. I truly believe that the more we connect with our hunting, our dogs, and with the natural order of things, the more we can create active and meaningful legacies. I look forward to creating more memories and recording more stories in my trusty Gun Dog Notebook. I am excited to share more of these stories through this 2018 hunting season and beyond. My stories will revolve around a dang classy gun dog and a slick Beretta 686. 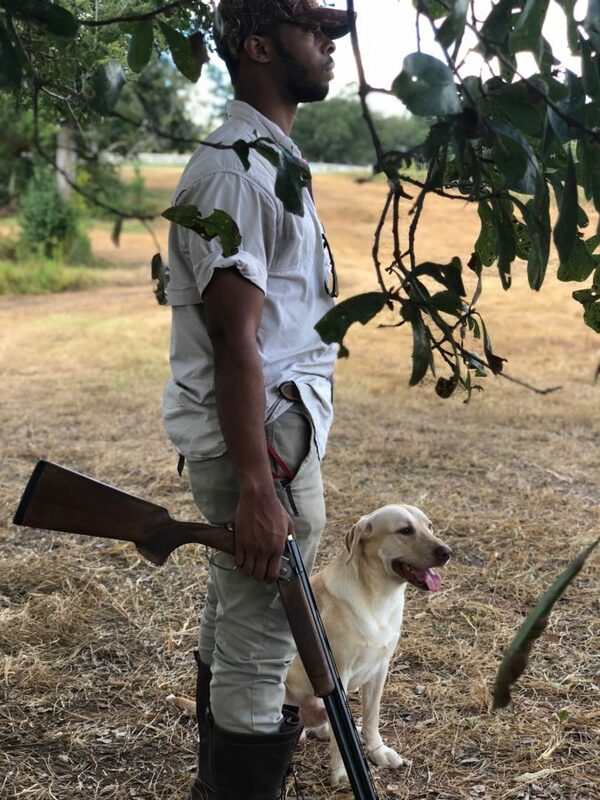 I look forward to sharing more thoughts from my perspective as a young, African American upland hunter from Atlanta, GA. What I hope to do here is give you, the reader, a piece of what is documented in The Gun Dog Notebook, and provide insights into a world of art, bird dogs, and the sporting lifestyle. I hope to encourage new beginnings and continued traditions. Thank you for reading and continuing this journey with Ruger and me. You can listen to Durrell’s podcast, The Gun Dog Notebook, by clicking here. You’ll also find it wherever you get podcasts. Awesome. My yellow lab, Hunter, and I, had many of the same experiences, learning together as we went. Nothing compares. I love the down-to-earth feel of it all. Looking forward to your podcasts. Thank you so much for you so much for reading and I will continue to deliver my experiences through my writing and podcast episodes! Its always about learning, no matter where one is or what stage they are. Thank you my yellow Lab friend! Welcome! I am looking forward to learning from your experiences, I am relatively new to upland bird hunting and looking towards obtaining my first bird dog in the near future. I have always relied on the graces of other people and their good will in sharing their gun dogs to this point. There is an ethos in this connection of man, dog, bird and nature than seems so vital to so many, I “hear” it in your narrative above and look forward reading your further entries in the “Gun Dog Notebook”, which I can only hope I too will soon begin my own similar journey and “Gun Dog Notebook”–again welcome! Thank you for such a warm welcome! It’s good to meet new wing shooters and I pray I can continue providing a wealth of quality articles and helpful podcasts. Even creating a Gun Dog Notebook was a helpful experience for me because it forced me to pay attention…to really observe. I truly appreciate you hearing what it is that I am saying through this entry and my other works. Keep in touch!